SINCE I paint alla prima I usually let my paint dry naturally without any additives. More often I will add walnut oil to slow drying if I need a two day painting session with a large painting. But occasionally I still have need to add dryers when I'm preparing for a show and I need to make a few last-minute adjustments. One such occasion was this week when I needed to adjust some paintings for an upcoming exhibit. I had three paintings that needed modification (see blog# 32). In the first one I used used Galkyd and chalk. 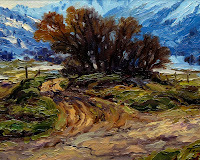 I added a few drops of cobalt dryer to this medium as well as a few drops to each bit of color. In my second painting I glazed the light parts of the painting using G-gel from Gamblin paints. I added G-gel to my paint as well. In my third painting I made a putty using walnut alkyd medium made by M. Graham & Company to which I added quite a bit of chalk to thicken it up. In all three cases when I needed white I used a fast drying alkyd titanium white. The mixture that dried the fastest was the first one, the medium with the cobalt dryer. It dried in one day. This didn't surprise me as cobalt dryer is a powerful additive. Normally I only use it in extreme cases because it is prone to crack and yellow and has toxicity issues. I might use it occasionally to add to a signature or last-minute preparation for a show. The other two mixtures dried in two days. So while I try not to make using dryers a habit I do use them in the preparation of some of my putties, especially my mixture of Gamblin G-gel and chalk which I think is a perfectly acceptable, archival addition to my painting methods. Thanks for your great website, Brad! What is the purpose of the chalk in the mediums, and do you use it in your regular alla prima painting? I add the chalk to my medium to thicken it (although adding chalk will help dry the paint, too). The medium I am painting into needs to be thicker than the paint. Otherwise the medium won't pull the paint off the brush. Usually I use G-gel and chalk. I don't add chalk to my paint as that would thicken it and make it so the underlying medium won't pull it off my brush is easily. If I need the paint to come off easier I might add a little walnut oil to my paint. Thanks the great question! I hope that clarifies things. Yes, my wife and I met Brian Mark Taylor at the Zions Bank show last November. He's a great painter. I really enjoy his work. I read the interview and certainly painters such as George Inness thought that spirituality was a component of their art. It is currently out of fashion probably from the grade school notion that religion is the sole cause of the world's woes, an idea sharply contradicted by the 20th century but still held by many. I think that as people rediscover the need to surround themselves with beauty they will find the confidence to champion beauty and we will see a return to subtly spiritual landscape such as the paintings produced by George Inness and others.